NEGROMANCER 2.0: Dark Horse Comics Announces "Witchfinder: City of the Dead"
Dark Horse Comics Announces "Witchfinder: City of the Dead"
MILWAUKIE, OR— This August, legendary Hellboy creator Mike Mignola, iZOMBIE co-creator Chris Roberson, original WITCHFINDER series artist Ben Stenbeck and colorist Michelle Madsen will unite for WITCHFINDER: CITY OF THE DEAD. 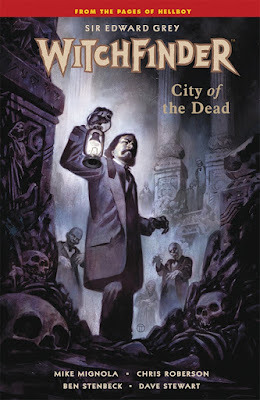 In this five part miniseries from Dark Horse Comics, Sir Edward Grey, occult adviser to the queen, must defeat scores of flesh-eating corpses on the loose in London and explore a temple beneath London full of ancient secrets. Artist Julián Totino Tedesco will provide covers for the series. Witchfinder: City of the Dead #1 (of 5) is in stores August 31, 2016.